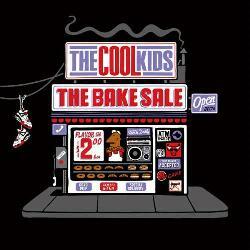 The Cool Kids first legitimate recording, The Bake Sale, feels like the closing of a first chapter. Most of its tracks have circulated around the Internet for several months, catapulting the previously unknown Mikey Rocks and Chuck Inglish onto a support slot for M.I.A.’s U.S. tour last fall and into the pages of several magazines, most notably the cover of URB. When heard via MySpace, spun piecemeal on an iTunes player, an iPod or in a cloistered nightclub, these songs sound like modest little wonders fattened with booming bass and snappy hooks. But when gathered together into the duo’s first real artistic statement, their strengths and weaknesses come into view. The Cool Kids relatively blithe approach to regionalism and class issues is what makes The Bake Sale – and the Chicago hipster scene from which they emerged – so interesting, if only because it’s been several years that a mainstream hip-hop group has been unafraid to skirt these topics. It’s refreshing, even if the choruses pale in comparison to the dope beats, and Mikey Rocks and Chuck Inglish tend to meander during their rap verses. They aspire to old-school glory, but don’t have the killer lines and succinctly fly rhymes that typified Schoolly D and Biz Markie’s classics. Instead, the Cool Kids are learning to make a new kind of classic edition, one both informed and unencumbered by the past. This entry was posted in Reviews and tagged The Cool Kids. Bookmark the permalink.